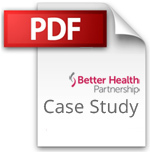 Better Health learned that the health system had adopted a deliberate strategy that drove the good results and worked with HealthSpan to help spread the best practice to benefit patients in other practices. Click on the image below to download the Improving Control of High Blood Pressure Across Patient Groups case study (PDF). One in three Americans has high blood pressure, which can lead to heart disease and stroke, leading causes of death in the United States. More than half of Americans with high blood pressure do not have good control. Minorities and patients with fewer resources have more complications and more deaths. Better Health’s routine data analyses in 2012 found a dramatic rise in blood pressure control in primary care practices of HealthSpan, which then was Kaiser Permanente Ohio: Up to 90% of patients with high blood pressure had their condition under good control – with readings under 140/90 – including African Americans, whose improvement has long lagged behind white patients’. Better Health learned that the health system had adopted a deliberate strategy that drove the good results and worked with HealthSpan to help spread the best practice to benefit patients in other practices. The intervention was shared at Better Health events and translated into a practical curriculum that busy practices could learn and implement, no matter their staffing model. Six one-hour, monthly sessions were developed to help practices improve five key elements known to increase blood pressure control.